We have been planning for high school for several months, now. Yak, currently taking a fun break, will spend a couple more months in “8th grade”, then start “9th grade” in or around September. According to conventional standards, he should be in 8th grade in September. The beauty of homeschool is not having to bow to conventional standards. Some may ask how I determine his grade level. I pretty much go by the math book, as his abilities are all over the board. To take a standardized test would just defeat the purpose. To place him in high school now, is to give him a challenge that he is ready for. More targeted studies. Preparing to decide if he will continue to study in college/university or learn a trade. Or start a business. To give him the responsibility to choose a direction and explore it in detail. He will continue with Algebra and higher math, but also complete a consumer math course. He will continue with daily essays and reading. He will start to look at different career paths and explore courses and activities related to them. He will start practicing for the SATs. 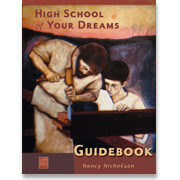 We are using High School of your Dreams, by Nancy Nicholson, available through Catholic Heritage Curriculum as a rough guideline. It provides general information on credit hours required for each subject, to qualify for “graduation”. We will use that guideline and Yak’s SAT scores to determine when he is ready to “graduate” high school. There are many tools available online to put together transcripts. We have also been keeping records, a portfolio of Yak’s work, and lots of pictures and videos of his projects. We will continue this record keeping, so that he will have a detailed portfolio and transcripts when and if he applies to colleges. Right now, though, we’re enjoying a couple weeks of summer break before hitting the books again.